Welcome to the last day of Teasers for My Favorite Things! Today is full of inspiration for you AND we have some fun prizes for you too, so be sure to hop on over to the MFT Blog to see how you can win some MFT goodies! For my card today, I'm inking up Birthday Greetings from Lisa Johnson Designs. I cut out two Pierced Circle STAX Die-namics in Smooth White and Nightshift Blue Card Stock and then stamped the greeting in Kraft Ink. 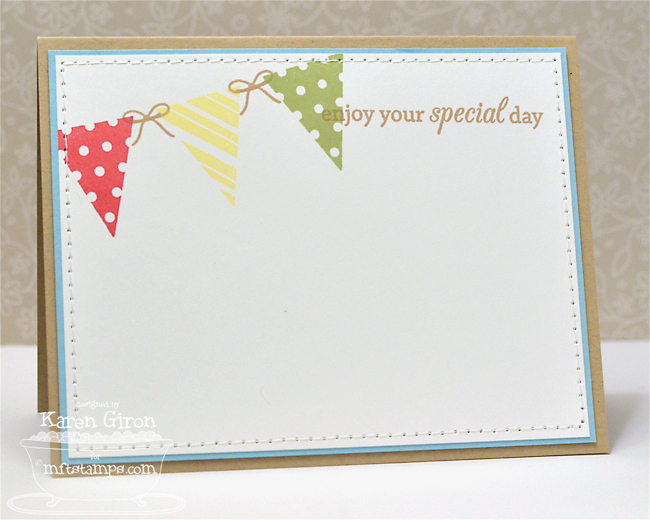 For the background, I stamped the 'happy' and 'birthday' stamps from Party Balloons in white pigment ink on Berrylicious Card Stock. The banner strip is made using LJD Bitty Banners Die-namics and I stamped the patterns from LJD Bitty Banners in white pigment ink. The layout is an old Sweet Sunday Sketch - SSSC166. The banners are repeated inside the card and I used the little bow and string from LJD Bitty Banners in Kraft Ink and then added another sentiment from LJD Birthday Greetings. Here are the MFT products I used today - all of the new products will be available for purchase in the MFT Boutique on July 9th at 10 PM Eastern. Love the clever stamping on your back ground and the design is fabulous. Karen, Love the banner on your beautifully stamped card. I am loving the pierced circle STAX and the banners! This is gorgeous, Karen! 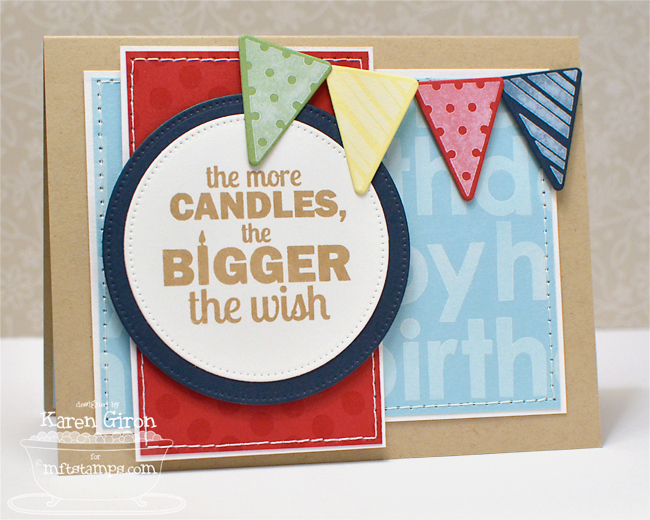 I LOVE the white stamping on coloured card stock...beautiful! Beautiful card! I love the colors and the banner is so cute! What a great birthday card. Great card for anyone. Love those birthday sentiments and bitty banners. Thanks for sharing. Karen, this is fab! Love the happy colours! Very pretty! The pierced circles look great- on my list! Love the colors and the design. This card could be used for so many people in your life. I love that too. awesome birthday card!!!! 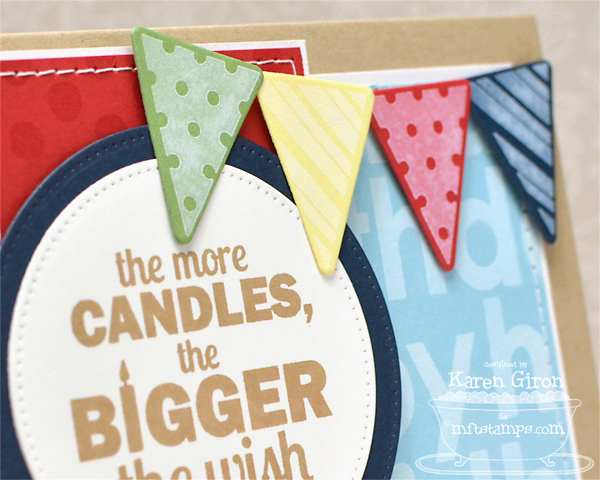 love the pennants and the giant circle AND that awesome birthday sentiment. I can't wait to get this new sentiment set. Love how you combined all the sets in this card, Karen! Too CUTE! Love love love this!! THe banners are fabulous!! LOVE this card!! I love the white ink on the different colors of CS!! It's SO pretty!! LOVE the new banner die and birthday greeting sets!!! Very cute birthday card. Great stitching and love the banners. What a great card, I just love all the colors & the design too.